Try these COPD care tips from the Salt Lake City home care experts. 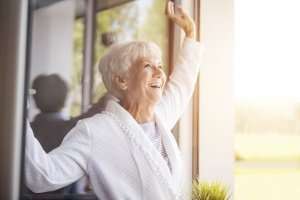 When providing COPD care for an older loved one in Utah or New Mexico, you’re probably well aware that outdoor air pollution can exacerbate symptoms. However, did you know that poor air quality in the home can also cause problems? Cleaning the air in the home can help those with COPD – and everyone else – breathe more comfortably. Forbid Indoor Smoking. Never smoke or allow anyone else to smoke in the home of someone with COPD. If there is a fireplace or woodstove in the home, realize that it can also be a cause of irritation for a senior with COPD. Minimize Chemical Exposure. Household chemicals such as paint and cleaning products can trigger COPD symptoms, so cut back on the use of harsh chemicals and be sure to keep lids are on cleaning products when not in use. It’s also a good idea to look into healthier cleaning alternatives, such as baking soda and vinegar. Cut Back on Dust. Wash bed linens on a weekly basis, remove clutter, and keep pets off of furniture in order to minimize the amount of dust and dander. Purify Air. Put in place an indoor air filtration device with a HEPA filter. Although air pollution is not as hazardous in rural areas as it is in a city, a senior with COPD will still benefit from filtering the air and clearing away any irritants and toxins. Keep the Floors Swept. Making sure that floors are clean reduces allergen buildup. Keep in mind that hardwood floors are much easier to keep in an allergen-free state than carpeting and rugs. Use a Humidifier. Dry air from the home’s heating system can make COPD problems worse, as can air that is too damp. Achieving a level of about 40% humidity inside the home is typically ideal for someone with COPD. Our professionally trained home healthcare team will first provide an in-home consultation to develop a care plan to address needs. Harmony Home Health & Hospice is here to help with personalized Provo hospice and home care services. Contact us online any time or call 1-877-I-NEED-CARE (1-877-463-3322) to learn more about the ways in-home health care services can help.